Pacific NorthWest Computers: Build Versus Buy a Computer?? Build Versus Buy a Computer?? The old debate over whether you should build your own system or buy a pre-built one is an old, long-standing argument that will never be easily washed away. However, there are some benefits to building your own system that can't be weighed in terms of dollars and cents. You may be happier with your own hand-built system, or you may be able to score bargains and rebates that lead to a more powerful computer stuffed with higher quality components than a manufacturer would use. 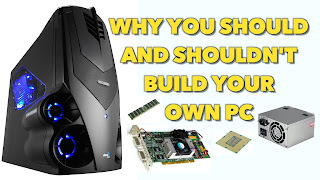 Building your own PC also gives you complete and full control over that system's components and extendability. Unlike buying an OEM PC, assembling your own gives you the ability to make decisions about when and how you'll upgrade that system in the long run as opposed to simply taking what the manufacturer sells you. For example, you can buy into a new motherboard chipset early and wait to spend money on the next generation of graphics card later, giving yourself a timely upgrade when the moment-or your budget-is right. Ultimately, while it may be easier to just pull out a credit card and buy whatever's on sale from your preferred OEM, there's something about assembling the components of a system that you've selected for your needs, powering it up, installing your favorite OS, and using it every day that's' incredibly rewarding.